Global energy-efficient data center solutions provider, Minkels has launched a new solution within its VariconPower power distribution range. The company said its new modular Busbar Systems with Smart Tap-Off Boxes will offer seamless integration with Cold Corridors, which will provide flexible configuration options for customer-specific Cold Corridor layouts in data centers. Its Busbar System will cover data center power distribution options varying from 160 amps to 1000 amps which will make it suitable for both large and medium-sized data centers. The vendor said its Smart Tap-Off Boxes offers users the option of flexibly laying out a power grid in the data center. It has also developed a smart meter for the system to provide accurate monitoring of the energy consumption. Minkels’ product manager Jules Sommers said the system is entirely modular and specifically designed for data centers. “That’s not only at the rack level, but also at the Cold Corridor level. That flexibility plus the compatibility with Cold Corridors is important if they want to be able to respond to dynamic and evolving power requirements in the data center,” Sommers said. 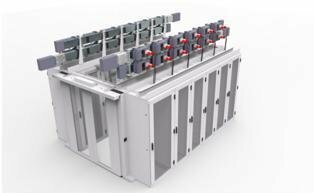 The Busbar Systems with Smart Tap-Off Boxes are available now and the Smart Meters are expected to be released in Q2 2014.